Kids Gift Sets - Boys and girls' umbrellas, ponchos & wellies! 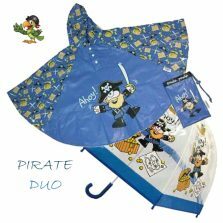 Here we have a number of bundled offers of children’s rainwear on special offer as kids gift sets. 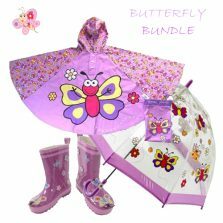 Kids gift sets - a number of bundled offers of children's rainwear on special offer as kids gift sets. 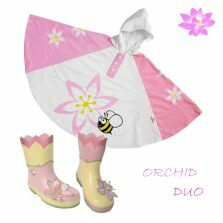 Some of our children's rainwear products are available in matching sets. These make great gifts for children - practical, functional but also fun and funky. Ideal for birthday presents and Christmas gifts from mum, dad, nan, grandad, auntie or uncle. These really do make fun, functional and practical gifts for the kids. Staying dry on the school run is essential, so its best to make sure your child stays well protected. But why stop there? Why not make your child shine on a dark, dreary day with some unique rainwear? So, if you're considering buying children's umbrellas, wellies, raincoats or hats as children's gifts why not take a look through these kid's gift sets and grab yourself a bargain. Total weather protection with matching wellies, umbrellas and rain ponchos.